He might be too conservative. Sen. Marco Rubio speaks during a campaign stop at a welding company in Brookline, New Hampshire, on Thursday. Why hasn’t Marco Rubio, widely described as the electable conservative, caught on? It’s difficult to say, and there’s still plenty of time — before and after Iowa — for a Rubio surge. Nonetheless, Rubio’s clearest problem is that he hasn’t won over the establishment: He could be the best of both worlds, an establishment-friendly nominee with tea party bona fides, but right now neither camp is rallying behind him with any conviction. Just look at the endorsements. For several weeks in late 2015, it looked like elected Republicans were inching toward Rubio. But that has largely stopped; Rubio received 10 endorsements from governors and members of Congress in November and seven in December. He has just two so far this month (Ted Cruz has received five), and Jeb Bush still remains the marginal leader in our endorsement tracker. Why aren’t members of Congress coming to save Rubio? Part of the answer may simply be that Rubio is too conservative and too anti-establishment. Rubio’s ideology tends to get lost next to that of Cruz, but he is one of the most conservative members of Congress. We can see this using DW-Nominate, an algorithm that rates members of Congress on a liberal-conservative scale based on their voting record. Rubio is more conservative than 77 percent of Republicans serving in Congress this term. Rubio has only received 10 endorsements from members of Congress who are more liberal than the median Republican. Despite being outflanked on the right by Cruz, he has 17 endorsements from House members and senators more conservative than the median Republican in Congress. Cruz has the most conservative voting record of any member of Congress, according to DW-Nominate, and all but one of his 17 endorsements have come from members more conservative than the median Republican member of Congress. More moderate members have been more likely to choose Bush. He has secured a similar number of congressional endorsements to Rubio’s (31 to 27), yet 26 of Bush’s endorsers are more moderate than the median Republican member of Congress. Just five of his endorsers are more conservative than the average member, and just one is more conservative than Rubio. Rubio’s other problem is that his voting pattern seems to be more anti-establishment than the average member of Congress. While it’s not always clear what “anti-establishment” means, DW-Nominate’s second dimension, as I have written about, is a decent proxy for it. It isn’t a perfect measurement and it probably overstates Rubio’s disagreements with the GOP leadership. Still, Rubio’s score on this metric indicates he is more anti-establishment than 88 percent of Republicans in Congress. It’d have to be way off for Rubio to somehow be considered establishment friendly. Rubio was elected in 2010 as a tea party supporter who challenged Florida’s sitting governor in a Senate race. Except for immigration reform (on which Rubio’s position seems malleable), there were few occasions when Rubio went to bat for a major cause of the establishment. Indeed, Rubio’s voting profile more closely resembles the House Freedom Caucus than it does a mainstream Republican. 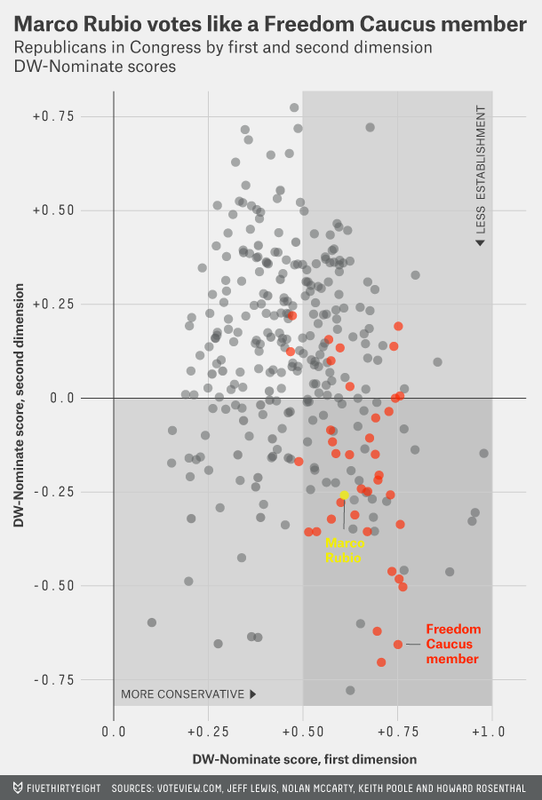 Check out this chart, which combines both dimensions of DW-Nominate and highlights Rubio and the members of the Freedom Caucus. If you look solely at this chart, you’d find it hard to imagine that Rubio could somehow be the “establishment” candidate. Why then was he supposed to be the mainstream savior? Part of that may have to do with his history as a dealmaker in the Florida legislature. A large part is probably because of his competition. Cruz and Donald Trump are about as anti-establishment as you can get. Cruz is hated by many in his party, which might be why Sen. Richard Burr, Republican of North Carolina, may have said, if jokingly, that he’d rather vote for Bernie Sanders than Cruz. Trump, of course, is Trump. In fact, Rubio’s median endorser in Congress is about as establishment-friendly as the median member of Congress, per DW-Nominate. Cruz’s median endorser, on the other hand, sports a score that is more anti-establishment than 72 percent of all members of Congress. Trump hasn’t gotten an endorsement from any member. Rubio’s problem is that the mere threat of Cruz and Trump hasn’t made many mainstream Republicans run to him with open arms. It may be, among other reasons, because they’re afraid that endorsements from the “establishment” would actually hurt Rubio. Voters seem to want an outsider this year, and YouGov has found that they’ve already pegged Rubio as a member of the establishment. But if Rubio’s voting record is any indication, it may be that Republican members of Congress are not choosing Rubio because his record doesn’t line up with theirs. Some may be hoping that Bush, Chris Christie or John Kasich can rally. If they can’t, or if Rubio wins a primary or two, we’ll see if Rubio’s fortunes on the endorsement front change.